BattleCreek® BedWarmer,Bed Warmer to keep you cozy throughout the night! Previous productBathtub Safety Rail 24"
Bed Warmer to keep you cozy throughout the night! Placed under the bottom sheet, the gentle heat rises to keep you cozy. 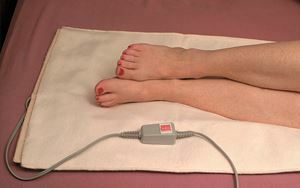 Ideal for persons with cold or achy feet, poor circulation in their extremities or Restless Leg Syndrome. Allows the user to heat the area quickly and then switch to low heat for gentle warmth throughout the night. Dimensions: 19.5” x 36” (50 x 91 cm). Ideal for either covering one side of the bed or lying across the entire foot of the bed.